Hiroshi Nagahama entertains a crowd at Animazement 2013. 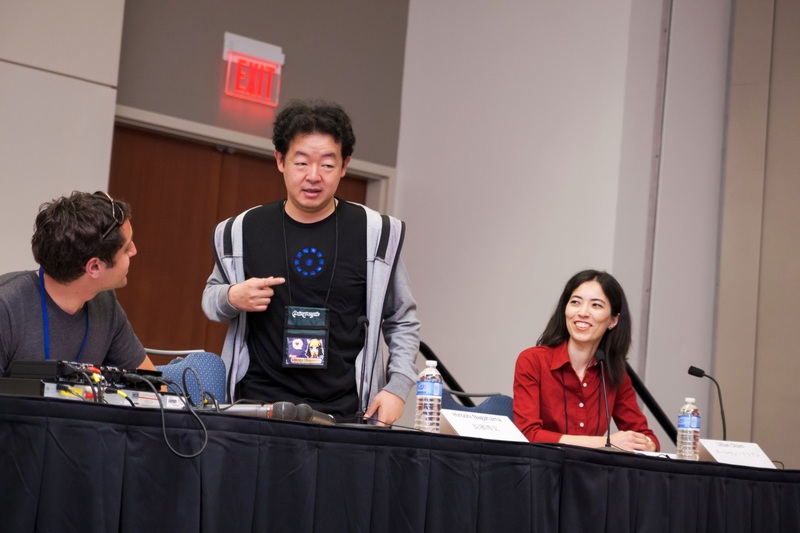 Shizuka, our photographer, attended and recorded Hiroshi Nagahama’s fan panel at Animazement 2013. Nagahama directed Mushi-shi, Detroit Metal City and most recently Aku no Hana (The Flowers of Evil). 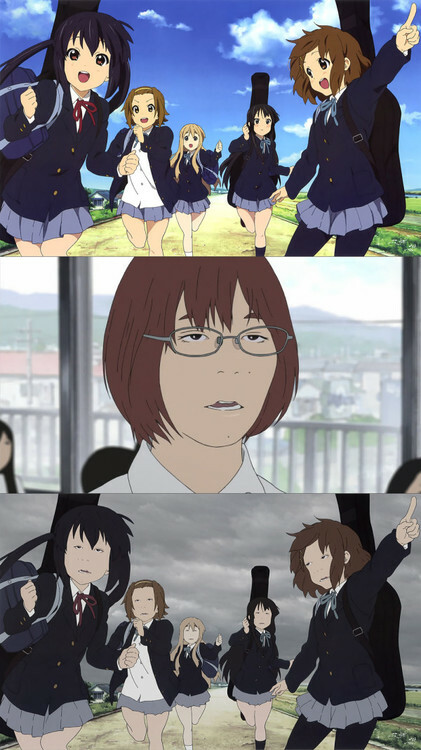 The pivotal seventh episode of Aku no Hana was shown near the beginning of the panel. This transcript is translated directly from Nagahama’s remarks from the Japanese by Rome, and edited for clarity by gendomike. The panel begins as Nagahama walks up on stage. He points to his shirt and points out that he’s cosplaying Iron Man 3 (see picture above). Then he sits down. Nagahama: I am currently working on the new anime Aku no Hana (The Flowers of Evil). What do you think of it? Nagahama: Really? In Japan, people got freaked out when we used rotoscoping, and [the technique] became controversial, a hot topic. We didn’t expect that….On the internet, it was huge, but we didn’t plot [the response]. The original is a manga, but I thought it would be the best to use rotoscoping for the adaptation. If you guys want, I can show you the latest episode, episode 7 Have you seen it? It just got aired in Japan. Most of the audience indicates that it has already seen the episode. You’ve already seen it? But they weren’t any subtitles, so you can’t understand it. But the latter part is only music and pictures, so I hope you may get that part, at least. Episode 7 of Aku no Hana is then shown, without subtitles. Nagahama: There is a question! Nagahama: I read the original manga thoroughly, and I thought that the feeling from its artwork was actually more real and vivid than the manga artist had depicted. It felt very close to how we are. Living in reality, you see and feel a tactile sensation, and I wanted to evoke that feeling of real life as closely as possible. So my only choice was rotoscoping. 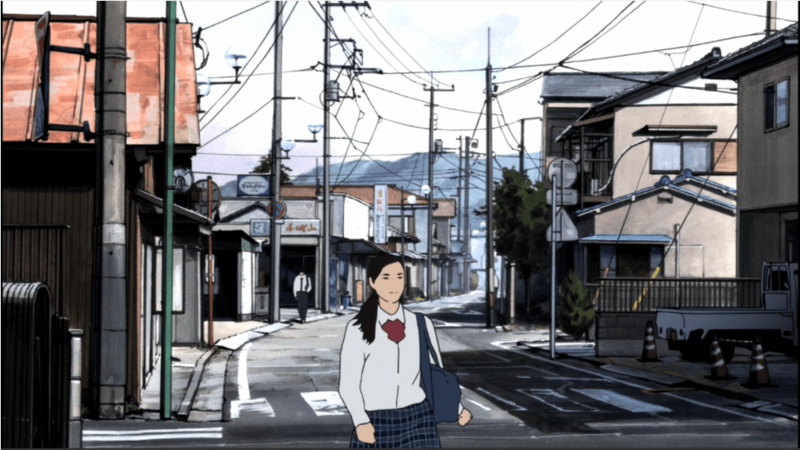 Q: What are some of the differences between traditional animation and rotoscoping? Nagahama: It took three and half months to shoot the live action scenes that the rotoscoping is based on, but the actual time to animate was about a month. Live action and animation production are not really that different, though it did take twice as long to edit. To me, making anime like my previous works, Mushishi and Detroit Metal City, used exactly the same techniques. The way you adapt the original work didn’t change a bit: you read the manga thoroughly, and you make the anime that perfectly fits the original manga. (Our Question): Your works tend to dwell on the hidden side of people or the world. Is this a theme that you are drawn to, or did it just end up that way? Nagahama: Both. I love American comics: X-Men vs. Magneto, Spiderman vs. Venom, Iron Man—and one of them is an alcoholic, what a secret! I was interested in them from my early days. Everyone knows that American comics have characters with a dark side. And Star Wars, of course: having a dark side is part of being a human being, and I’m interested in that. Q: If goal was realism, why rotoscoping, and not live action? Nagahama: If you make it live action, then you will notice and tend to fixate on the real human actor projected on screen. For example, Iron Man: I love the Iron Man movie, I really love it, but when it was made into a live action film, there is a risk. In the film Tony Stark doesn’t really exist—more accurately, it wasn’t Tony Stark but Tony Stark as played by Robert Downey Jr. And people will think that Tony Stark as played by Robert Downey Jr. is really cool. But Tony Stark doesn’t really exist anywhere in the world except in a comic book, which can only really appear in motion pictures as animation. But in the case of an animated Tony Stark, it requires a high level of skill to connect the animated world to our own, and there will always be a gap between its world and ours. So in order to connect the animated world to ours, we have to choose something in between: something that is not anime and also not live action. That is why we did the rotoscoping this time. If someone asks whether rotoscoping is the best choice, we wouldn’t know. But we try rotoscoping first anyway, then we think, and that’s the case. Does that make sense? Q: Did you expect to get backlash to episode 1? Nagahama: I knew there would be criticism because we chose the method that we did. Even if this rotoscoping was accused of being creepy, it’s way better than if the audience didn’t feel anything. Tor example, this aired on TV: so if you turn on the TV at midnight, you can watch this show and see that this anime is so different from the usual anime. So it’s creepy. But 5 years from now, if this anime is still sold, you’ll see it and think, “oh this is that creepy anime, maybe I should give a try.” And then you’ll watch it, and if you discover something new from that, I would be happy. There are so many anime in Japan, and most of them fail to leave any lasting impression. I didn’t want my anime to be just another show, and I didn’t want to treat the original work that way. That’s how I felt. Q: How did you develop your own personal directing style? Q: I was just wondering, how you pick your projects? What do you search for to find what to work on? Nagahama: I really wanted to do Mushi-shi, so I begged them to let me do it, and I could die happily if I did it. But I’m still alive even after Mushi-shi, so that means I can’t accept death. As for Detroit Metal City, I refused at first. But then a different idea popped up in me, so I animated that too. 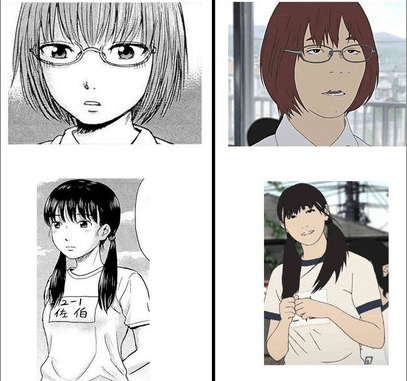 Aku no Hana was the same. So I did only two types of work: one I really wanted to do, or ones I refused at first but but did anyway. And I think it will be like that in the future. Q (by Omo): The stuffed animal [on the bed] from episode 7 – is that actually the voice actor’s rotoscoped bear? (It resembles one from another anime.) 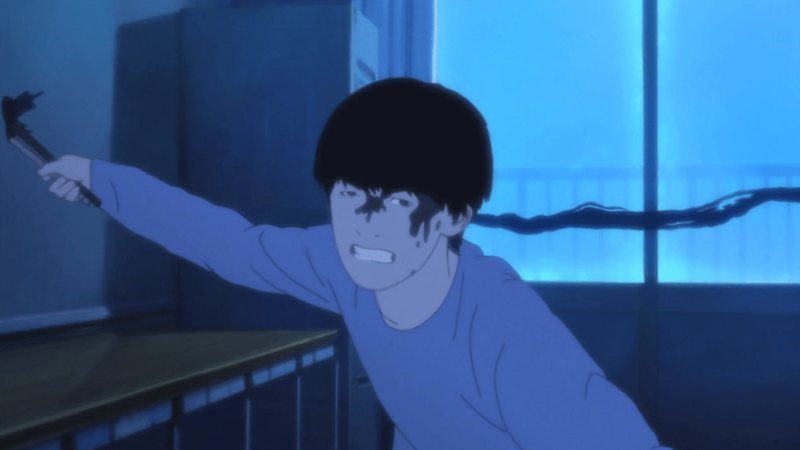 Also was the hair rotoscoped [in the end credits with the manga-ka, Oshimi]? Nagahama: Really? these dolls were of the actress that played Saeki, Yuriko Mishina, so I made her bring her own dolls. And the doll had very long limbs, like Jason, so I folded it and tied it and put it there. But as a result, I reckon it resembled Gooter. As for [Oshimi’s] hair, this is the first time I was asked that question both in Japan and the USA! Everyone asks about the rotoscoping because it leaves such a strong impression. So, to tell you the truth, that end credit self-portait was in the original manga and I drew it myself: I traced and made the original picture for the animation. I used different material for the hair and made it move. 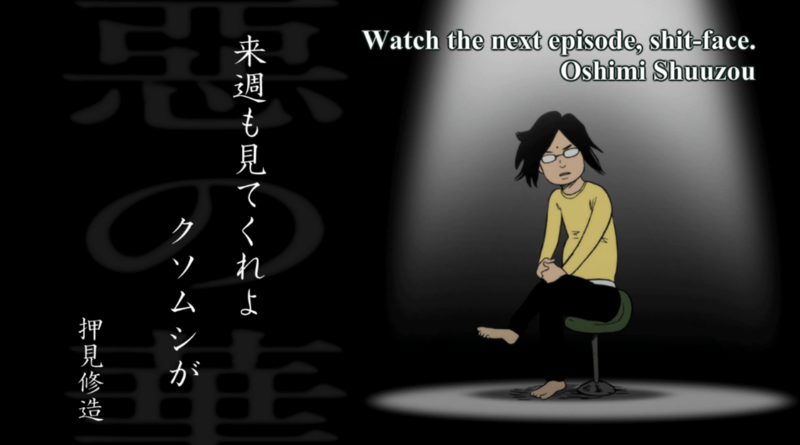 Most of Aku no Hana is of course animated in the opposite way, but for the end card I had actually wanted to do it in Flash, almost as a symbol of this anime. But no one could do a Flash animation, so I made them animate the hair in a Flash-like style. That gave it a weird atmosphere, and the picture that come out made me say, ummmm. Q: The soundtrack and animation create a very unique atmosphere. How did you want the viewer to feel through that? Nagahama: Atmosphere? That’s difficult to answer. Mushiishi was the same and this time Aku No Hana is the same. It’s like when you meet a new person for the first time: you are going to see that person’s mannerisms, hairstyle, fashion style, the visual information that comes in first. Then you talk to that person, and you hear that his voice is deep and warm, and talks fast, or slow. Then the words themselves come in: oh he’s interested in those things, oh, he doesn’t click with me, or oh, this person has a common interest. …If you get lazy with your own work, or if you let your guard down, it’s like meeting a new person and thinking, “oh, I’ve met this person before!” “Oh, this person is just like that other guy.” You have a preconception that “oh, this person mostly doesn’t like this” or “I don’t really like this type of person.” [Analogously], you think that a given work is going to be easy to pigeonhole, and I don’t want that to happen. Just like when you meet a stranger for the first time and you wonder what kind of person it is, I want have the audience to have the same curiosity and take interest in my work. You have to grab their interest before they can like it. Maybe you can’t go in to a group that is devoted to perfect Naruto cosplay saying that you like Gundam. But if you are a little off, or not clear, getting “sorry, I don’t quite get that, so what are you?” can evoke that kind of atmosphere, but if that strangeness goes too far, then no one will come to you. They get the impression “Oh wow, scary, what is that person? Why is that person dressing up so weird?” Then no one would touch you. But it’s not like that: you co-exist within the same animation, so I don’t want to make my anime like a person you’ve already met, or treated in that manner. So I am going to make more anime in a similar style. But, this work that I’m intending to do, if this is going to be fulfilled, some interesting works will be put in motion. If you guys can wait for that, I will be happy. and like Aku No Hana, it’s not like that I’m only taking this direction with cute girls, and indeed I get a lot of offers of that type of anime, but right now as far as timing concern, I can’t do it. I’m really happy to hear the feedback, and also answer your questions. 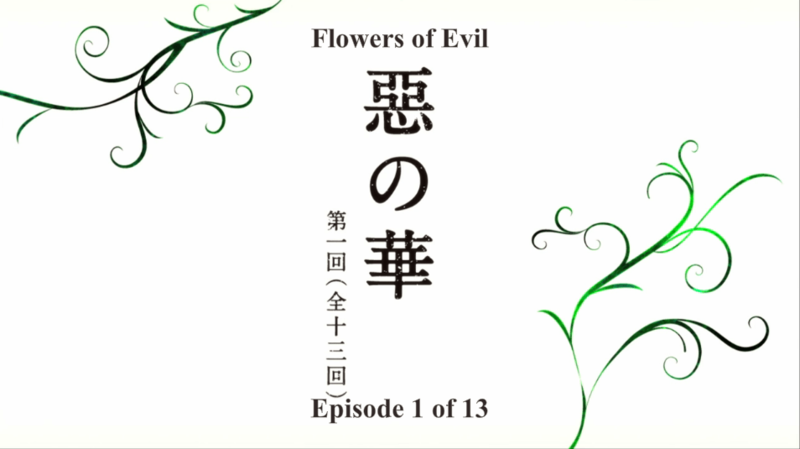 Whatever else can be said about the anime version of Aku no Hana (The Flowers of Evil—or, really, Les Fleurs du Mal), one cannot accuse mangaka Shuzo Oshimi and director Hiroshi Nagahama of misunderstanding the spirit that Charles Baudelaire, whose poetry inspired the story, was working within. Baudelaire and other Decadent, avant-garde French artists and writers inaugurated all of the tropes that we now recognize as “modern art” and modernist literature, and central to their self-understanding was that they were against everything conventional, complacent, middle-class, and comforting. Or, to sum it up in Flaubert’s rallying cry, épater les bourgeoisie: shock the middle class. From right out of the starting gate, Aku no Hana’s aggressively anti-kawaii, anti-moe, almost anti-anime anime style can be seen as one giant middle finger raised to current fandom: épater l’otakusie! 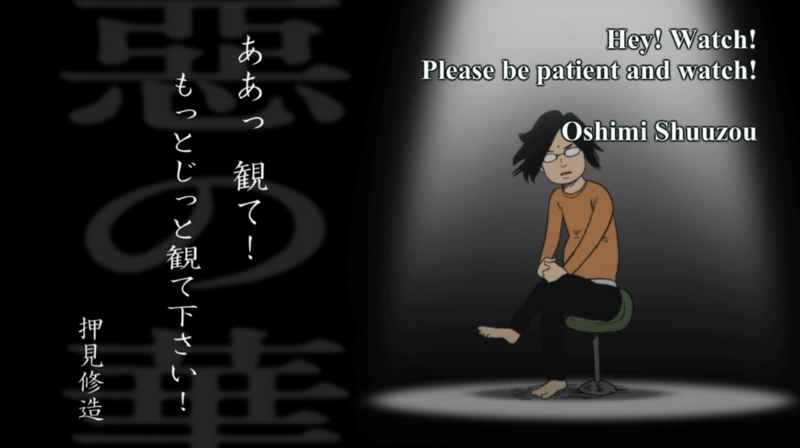 A perfect encapsulation of Oshimi’s attitude. 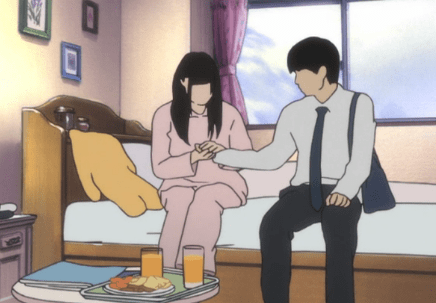 Oshimi and Nagahama admitted it, in an interview explaining their intentions: they deliberately intended to “scar” the audience. 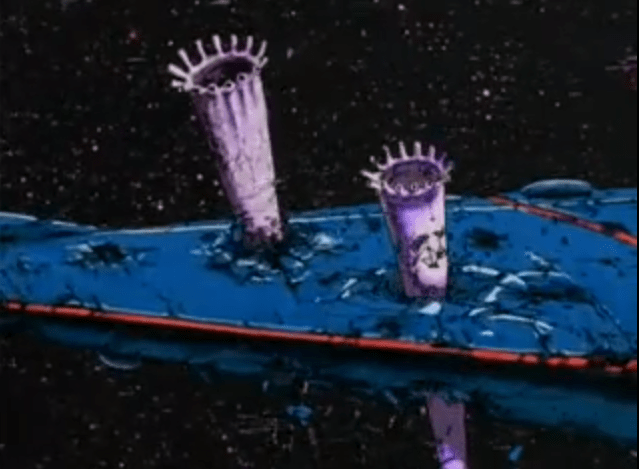 They withheld the character designs until broadcast, which in this case was not a sign of misgiving about the show’s prospects as much as a deliberate provocation. They knew that many would regard this as a form of aesthetic violence, even a declaration of war, especially given that Oshimi’s manga itself didn’t quite look so unconventional. But he was in on it the whole time, even stating that the anime is much more like how he imagined the story to be in his head as he drew and wrote it. Nagahama, for his part, thought this should have been live action to begin with; he only agreed to animate it if it would be rotoscoped to his liking. Oshimi agreed. The result predictably divided audiences, which was almost certainly the intention. For some it became a litmus test of how far “above” moe or cuteness, or traditional anime in general, one’s appreciation was: this was “realistic” and thus substantial. For others, it was an utterly pointless, even nihilistic “crime” against what makes anime appealing—not to mention technically subpar, given how sketchy the rotoscoped faces were. It closely mirrors the reaction that audiences often give when presented with challenging avant-garde art, like Stravinsky’s Rite of Spring or seeing Duchamp’s toilet in a gallery. There’s a lot of heated debate about whether this is even art to begin with, or if the audience is simply too conventional (too otaku, too moe-fied) to appreciate the greatness before them. What’s really interesting too is that there is actually great conventional beauty in Aku no Hana: the background art and haunting score, as one might expect from the director of Mushi-shi, is superb. The contrast between the near photo-realism of the backdrops and the aggressive plainness of the characters is part of the shock. Aku no Hana, at least in its first episode, excels at building the atmosphere of ennui and creeping obsession that fits the poetry it takes after. The repetition of scenes and shots, with an almost Hideaki Anno-like focus on signs, empty streets, and rust, powerfully conveys the sense of futility in the lives of the main characters. (That the backgrounds are almost as detailed as anything by Makoto Shinkai or PA Works, but with much more decay, may also be a sly commentary as well. No light-dappled, sakura petal infested landscapes here.) These are all easily virtues that can be found in many other anime as well, and were it not for the character designs, fan reaction would have been far more unanimously positive. Note the contrast between the face and the background detail. But the faces. 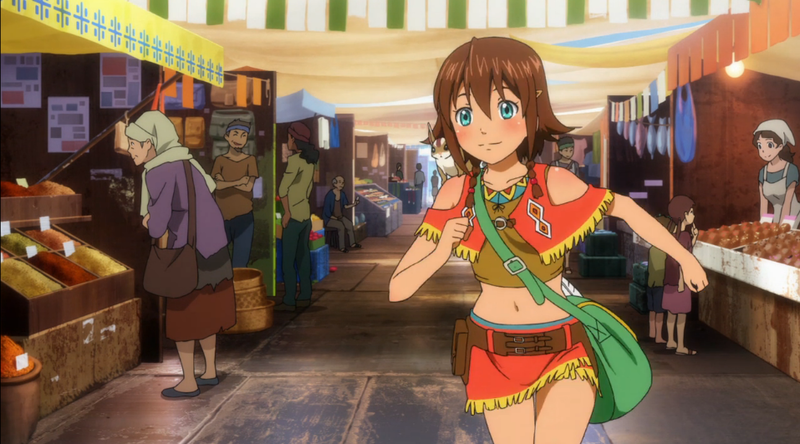 The unfeminine (by anime convention), sometimes blank, uncanny faces…the chunky physiques. That alone has turned off so many. It’s as if the creators are challenging the viewer: “everything else about this show is promising, but can you get past this?” The implied moral judgment behind that challenge—that one is a superficial fan if one cannot look past the character designs—is perhaps what irritates so many. There seems something smug and superior about it all, even as one might feel a smidgen of guilt: do I really watch anime because everyone is so cute/handsome/bishie/moe? Because there are no plain or fat people in it? Both of these characters, in the story, are meant to be attractive to the main characters. 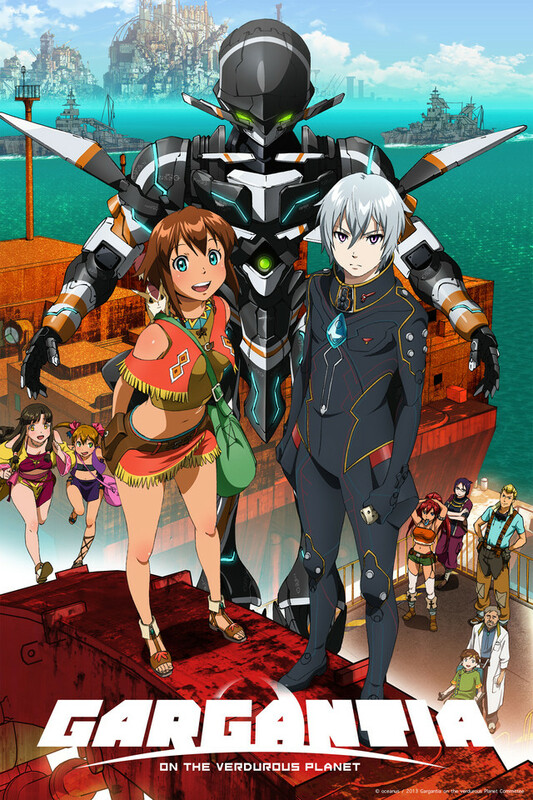 One can make the argument that in a way the anime has failed to communicate that to a large segment of the audience. 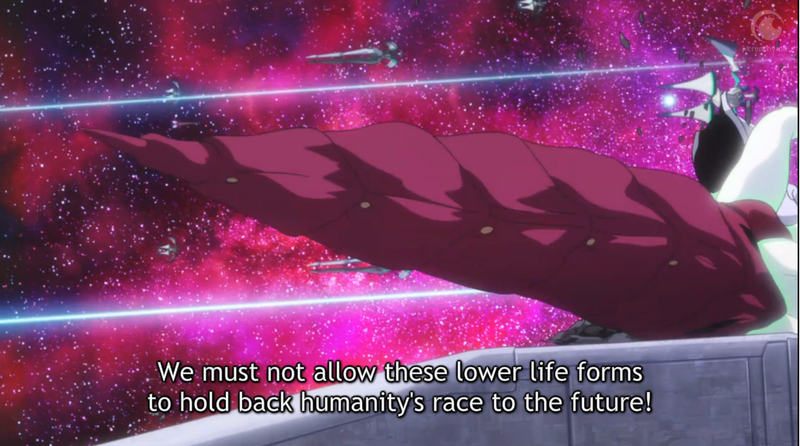 Frankly, I agree; I like the manga designs better. Of course, that may very well be the point: to present something other than the “traditional” or “conventional” style of beauty in anime. Real girls tend to look more like the ones on the right rather than the left. Realism can’t be the only thing, though, given how faceless a lot of the rotoscoped characters are from a distance—they almost become abstractions, not unlike the shadowy people in Serial Experiments Lain (which this show oddly feels like sometimes). Moreover, you can actually see their real life counterparts of the characters here, the models used for the rotoscoping. The models look decently attractive in their photos to me! In the translation from live action to anime, something got “creepified,” for lack of a better term. I have no choice but to think that this is intentional, given the themes and mood of the show. Honestly, they don’t look that terrible. Here is my final thought: if I had to pick a side, I do think the promise of Aku no Hana outweighs its “ugliness.” There is enough going on that fascinates and reassures me that there may be quality to come. However, bold artistic choices like this demand high standards. The character designs need to fit with the kind of series or story they are telling, and not just be different for different’s sake or, worse, there just to give the finger to fandom. That’s not good enough. If this is Nagahama and Oshimi throwing down the gauntlet—well, we better get our satisfaction then. Or, in short: put up or shut up.